[XPB-19820] Our 20 Door Cell Phone Lockers are made entirely of aluminum are ideal for use in health clubs, government facilities, office buildings, schools and other settings where small personal items need to be stored safely and securely. Cell phone lockers can be surface mounted or counter top mounted and accommodate cell phones, keys, wallets, cameras, tablet PC's and other small valuable items. Cell phone lockers feature a durable powder coated finish available in four (4) contemporary colors and five (5) door configurations with standard A doors and larger B doors. Cell phone locker compartments are 8” deep. 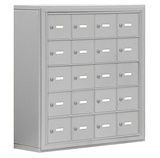 Cell phone lockers are available with master keyed locks or resettable combination locks. Master keyed locks include three (3) keys and allow access to all compartments with a master control key. Resettable combination locks can be set to a fixed combination or a combination that can be reset after each use. A master control key is available for the resettable combination locks that will override the combination and open the locks. For shipping quotes, orders or questions please call our Customer Service Center at 1-877-483-9270.